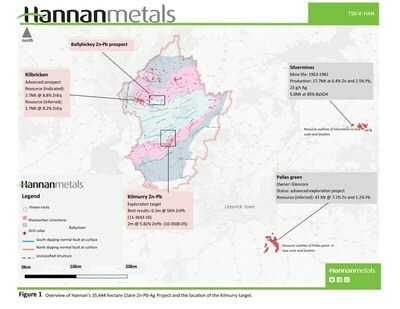 VANCOUVER, Feb. 6, 2019 /CNW/ - Hannan Metals Limited ("Hannan" or the "Company") (TSXV: HAN) (OTCPK: HANNF) is pleased to announce that diamond drilling has commenced at the Kilmurry project within the 100% owned Clare zinc project in Ireland after receipt of final drill permissions from the relevant authorities. Hole 11-3643-10 showed dissolution textures, alteration and mineralization in the upper sequence of the hanging wall, including 0.3m @ 56% zinc + lead at 166m depth and extensive development of fault scarp debris material suggesting the Kilmurry fault was active during sedimentation. The drill hole ended with 3 to 4 times background levels of zinc (>60 ppm) in highly altered limestone. 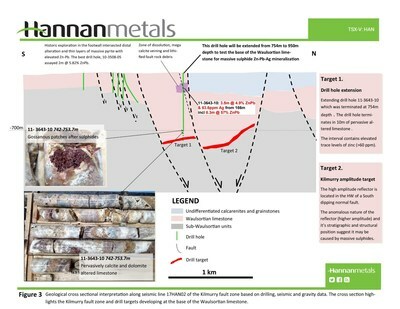 Michael Hudson, Chairman and CEO states, "The Kilmurry area is highly prospective and demonstrates all the right ingredients for a major base metal system where the scale of the untested fault and host rock point to the potential for a transformative discovery. This target is a direct outcome of the regional target generation work, driven by the seismic surveys completed by Hannan over the last year." Drilling has now commenced at Kilmurry, located 9 kilometres south of Hannan's Kilbricken resource (Figure 1). 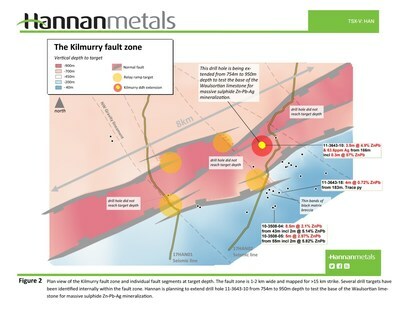 Kilmurry is a seismic and detailed gravity defined structural and stratigraphic target mapped by Hannan over greater than 15 kilometres strike and 1-2 kilometres width (Figure 3). The mineralized position of the hanging wall of the fault, that is an equivalent setting to all zinc mineralization in the Irish Midlands, has never been drill tested. Several geological factors make the fault zone a prospective target for zinc-lead-silver mineralization. Firstly, the entire fault zone was active during the formation of the Waulsortian limestone. The individual fault segments are closely spaced and have significant vertical offset, with the maximum mapped offset being one of the largest basin-scale displacements (>750 metres) mapped in Ireland. Closely spaced faults and significant fault offset along a relay fault system have a direct correlation with rock deformation and mineralizing fluid path ways in Irish-style zinc-lead-silver deposits. 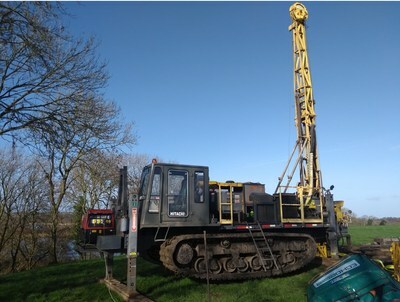 Furthermore, historic drilling has identified significant alteration and mineralization immediately south in the footwall of the Kilmurry fault zone. Four historic drill holes that have tested the hanging wall of the fault zone never reached the target depth. The holes were drilled over 3.5 kilometre strike and all encountered geological evidence to support the seismic interpretation of the fault zone. Drill hole 11-3643-10 is the most significant and it intersected structurally hosted massive sulphides at 166m depth (0.3m @ 56% zinc + lead). The drill extension of 11-3643-10 being undertaken by Hannan is the first test of the fault zone (Figure 2). If the extension of 11-3643-10 is successful, shallower ramp zones linking the fault segments will be targeted at Kilmurry. Hannan Metals Limited is a base metal project generation company. It has 100% ownership of the County Clare Zn-Pb-Ag project in Ireland, which consists of 9 prospecting licenses for 35,444 hectares and has recently filed mineral claim applications for 14,800 hectares within the San Martin Province in Peru searching for copper and silver. Over the last decade, the team behind Hannan has forged a long and successful record of discovering, financing and advancing mineral projects in Europe and Peru. Certain information set forth in this news release contains "forward-looking statements", and "forward- looking information" under applicable securities laws. Except for statements of historical fact, certain information contained herein constitutes forward-looking statements, which include the Company's expectations regarding future performance based on current results, expected cash costs based on the Company's current internal expectations, estimates, projections, assumptions and beliefs, which may prove to be incorrect. These statements are not guarantees of future performance and undue reliance should not be placed on them. Such forward-looking statements necessarily involve known and unknown risks and uncertainties, which may cause the Company's actual performance and financial results in future periods to differ materially from any projects of future performance or results expressed or implied by such forward-looking statement. These risks and uncertainties include, but are not limited to: The Company's expectations regarding timing to complete field work and outcome of results, the granting of the claim applications in Peru, community relations, liabilities inherent in mine development and production, geological risks, the financial markets generally, and the ability of the Company to raise additional capital to fund future operations. There can be no assurance that forward-looking statements will prove to be accurate, and actual results and future events could differ materially from those anticipated in such statements. The Company undertakes no obligation to update forward-looking statements if circumstances or management's estimates or opinions should change except as required by applicable securities laws. The reader is cautioned not to place undue reliance on forward-looking statements.